Many believe that school buses are the safest method of transportation for children to get to school, but is it the healthiest? Diesel pollution is becoming a more significant problem across the United States today and specifically, the Lehigh Valley is experiencing more and more Diesel pollution as time progresses. This ongoing issue is partly due to school buses in the area transporting children to/from school and various events. 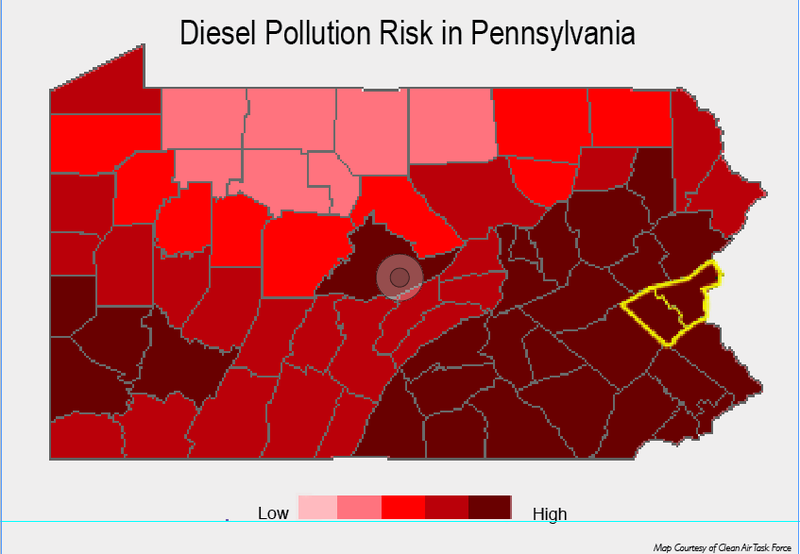 After analyzing the map below one may notice that the Lehigh Valley in specific is at the highest health risk due to the diesel pollution in the area. Northampton County is ranked as one of the most unhealthy counties at 123 out of 3, 109 counties and Lehigh County has been placed at number 85. The health effects from inhaling the Diesel fine particles are endless in both children and adults. For example, projections have been taken based on the Diesel pollution levels in the area. It has been estimated that 397 premature deaths have occurred due to diesel inhalation and 431 non-fatal heart attacks, both in adults alone. It has also been projected that 252 asthma emergency room visits by children and 462 acute cases of bronchitis also in children have resulted due to this form of pollution. I’m sure that many parents would argue that putting their child on a bus to school is the safest method of transportation, but from the above discoveries, it is not necessarily the healthiest. This is because the cabin pollution can come from both the roadway and the bus itself. There are many steps that can be taken to reduce the amount of diesel pollution in the area. People within the area should become more conscious about this problem and try to address the issue. For example, by limiting idling time to between 3-5 minutes for buses, the amount of Diesel pollution would greatly decrease. Also, by retrofitting the school buses with a particulate filter and a closed crankcase ventilation system the surrounding environment and the people onboard the bus would benefit drastically. This is because the particulate filter would replace the muffler and reduce the amount of particles released into the air. The equipment used in the closed crankcase ventilation system, inhibits the amount of exhaust that could potentially seep into the bus cabin or be released into the air. This system decreases the amount of toxins and redirects the exhaust created from the engine to the tailpipe where the particulate filter can continue to remove pollutants. There are also many other measures that can be taken to limit the amount of diesel pollution in the Lehigh Valley as school buses are not the only reason for this ongoing problem. As it is obvious from the above statistics that something needs to be done in order to alter the amount of diesel pollution in the area, I feel as though the general public does not know how significant this issue is to their environment, and their health. We need to get the word out there to the local school districts and communities about the horrible effects that diesel pollution has on the Lehigh Valley, partly due to school buses.